The patient is placed flat (supine) on the operating table and the neck extended to pull the thyroid from the root of the neck. A special pillow supports the head and a shoulder support is placed behind the shoulder blades. The whole operating table is tilted 5-10 degrees feet-down in order to reduce venous pressure in the neck. A small magnetic mat is placed on the patient to stop the loss of instruments. The line of the incision is marked with a pen before the surgery takes place. There has been a tendency in the past for incisions in thyroid surgery to be made too long. The incision should be curved and approximately 2-4 cms in length, placed 3-4cm above the suprasternal notch. Incisions made too low in the neck are more prone to scar (keloid formation). The initial incision should include the skin, subcutaneous tissues and platysma muscle. Care must be taken not to damage the cutaneous branches of the cervical plexus, which causes a loss of sensation in the front of the neck. A plane is then developed between the platysma muscle and other underlying tissues. It is best to develop this plane laterally first because the platysma muscle is more obvious in the lateral neck.After this plane has been opened up, the wound is held open with self-retaining retractors. The thyroid is then exposed by separating the strap muscles. After a midline incision has been made through deep fascia and between the paired strap muscles, the sternothyroid muscle is then bluntly dissected away from the thyroid. 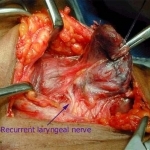 It is mandatory to identify the recurrent laryngeal nerve before removing the thyroid. It is important to visualise the nerve, usually by identifying it low in the neck and following its course into the larynx. No structure should ever be divided until the recurrent laryngeal nerve has been identified both anatomically and by the nerve monitor. The recurrent has a fairly constant relationship to the tubercle of Zuckerkandl. The tubercle of Zuckerandl is a lateral or posterior projection from the lateral lobe of the thyroid.The tubercle varies in size but in 93% of cases the recurrent laryngeal runs in a fissure between the tubercle and trachea or main lateral lobe. The concept in the past of the nerve running through the thyroid is incorrect,if it appears to do so it means one has a grossly enlarged tubercle. Randolph in his superb book on Surgery of the Thyroid and Parathyroid Glands describes three three ways to find the nerve,all should be performed with nerve monitoring. These approaches are shown in the pictures below. There is no perfect approach, and they all have their advantages and disadvantages. Our firm view is that all approaches should be aided by the use of a nerve monitor. If the nerve cannot be identified on the right side then a non-recurrent form must be considered. (1in 100 cases). If both lobes of the thyroid are to be removed, then the larger lobe is removed first. Once this lobe has been removed, the mobilisation of the other lobe is easier. In order to mobilise the superior pole of the thyroid, the superior thyroid arteries and veins need to be ligated and divided. The problem with this procedure is the close proximity of the external branch of the superior laryngeal nerve. When mobilising the lower pole of the thyroid, the main trunk of the inferior thyroid artery is not ligated as this vessel supplies the parathyroids. Instead the terminal branches are found and ligated. At this stage the parathyroids are found and preserved, where possible. After the lobe has been fully mobilised, the vessels ligated and divided, and the recurrent laryngeal nerve identified, the thyroid is ready for resection. It is essential that haemostasis is secured prior to closure. Placing the patient in a head-down position with the anaesthetist performing a Valsalva manoeuvre on the patient can check bleeding. Drainage of the wound is controversial. Some surgeons never drain the wound while others always do! In most cases we leave a space between the the strap muscles at their lower end. We do this because we feel that if a haematoma does occur it is easy to drain through a small skin incision. A good working rule is that if you think it might be necessary to drain the wound then do so. One must remember that there is no evidence that draining the wound prevents the complication of severe bleeding, but it might reduce the risk of a seroma.